Seeing the satisfaction in my patient’s eyes and their smile is the best part about my job. 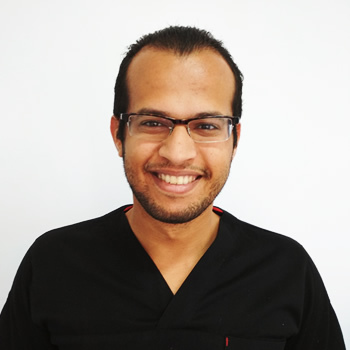 Dr Ahmed has wanted to pursue a career in dentistry since he was a child. After being inspired by his own dentist who was gentle and caring, he set out to follow in his footsteps—and never looked back. Today, Dr Ahmed helps hundreds of patients every year experience quality, effective dental care that restores smiles and boosts confidence. Dr Ahmed obtained his Dental Science and Oral Surgery Degree in Egypt, graduating in 2011. Ever since, he’s continued to take professional development courses in order to provide his patients with the absolute best care. Recently, course work has included dental implants, root canals, Invisalign, soft tissue laser management and other cosmetic courses. When he isn’t crafting beautiful smiles in the practice, Dr Ahmed enjoys playing football and going to the beach. Get to know more about him when you book your next visit with us. We look forward to welcoming you to the practice!